My Mom loved to cook and she was very good at it. In addition to her recipe box she had two cloth-bound journals in which she wrote and taped clipped recipes. Some she made, many she didn’t. This cinnamon pecan swirl coffee cake is one she never made. I’m always looking for quick and easy coffee cake recipes to have on hand for busy mornings. Recipe number four in the 52 Week New Recipe Challenge fits the bill. Not too sweet but full of cinnamony goodness. I added a powered sugar glaze. Heat oven to 350 degrees F. Grease a 9 x 5 x 3 inch loaf pan and set aside. For the swirl mixture, in a small bowl combine the cinnamon, sugar and pecans and set aside. Melt 2 tablespoons of butter and set aside. For the cake: In a medium bowl, thoroughly combine flour, baking powder, baking soda, and salt. Set aside. In large bowl, using an electric mixer, beat the remaining 1/2 cup butter with the sugar until fluffy. Beat in the vanilla. Add the eggs, one at a time, beating well after each addition. Beat in flour mixture one-third at a time, alternating with the sour cream, until well combined. Pour half the batter into prepared pan and cover with half the cinnamon pecan mixture. Spread remaining batter over and top with remaining cinnamon pecan mixture. Sprinkle on the reserved melted butter. With a shape knife, cut swirl mixture into the batter. Bake one hour, or until a toothpick inserted in the center comes out clean. Cool in pan on a rack and remove from pan when completely cool. Drizzle with powdered sugar icing, if desired. For the icing: Combine all ingredients in a small bowl. Whisk until drizzling consistency, adding more milk as necessary to achieve desired drizzle. Using a spoon, drizzle over cooled cake once it’s removed from the pan. 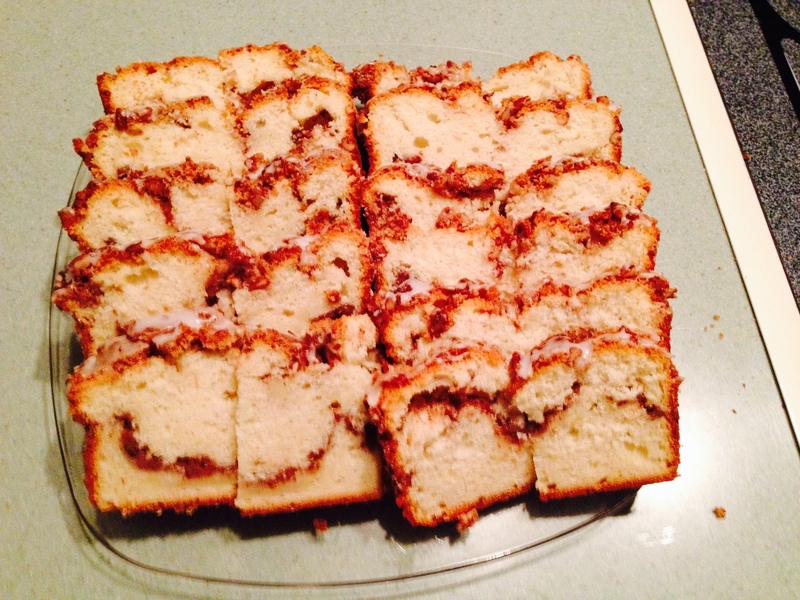 This entry was posted in 52 Week Challenge, Breakfast, Company Worthy and tagged Breakfast, cinnamon, cinnamon swirl, coffee cake, coffeecake, pecans. Bookmark the permalink.